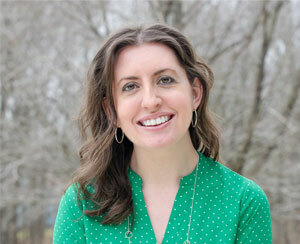 I am so honored today to be able to join in with a group of incredibly talented bloggers as part of the Seasons of Home Tour hosted by Kristen of Ella Claire Inspired. Everyone involved has been busy decorating their homes for fall and now Christmas. There are always so many ideas that pop into my mind when I see what can be done in the home as part of this tour. 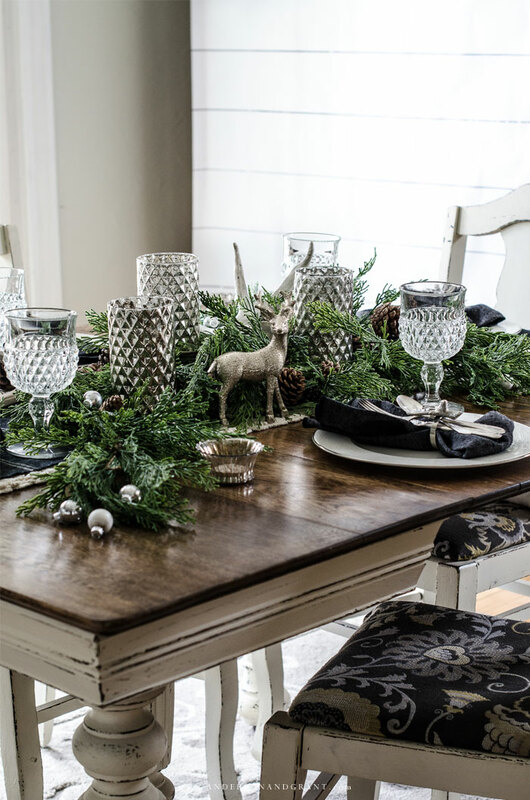 Obviously, today is all about Christmas tablescapes, which quite, honestly are always one of my favorite to put together. You'll find the links to everyone participating at the bottom of this post. 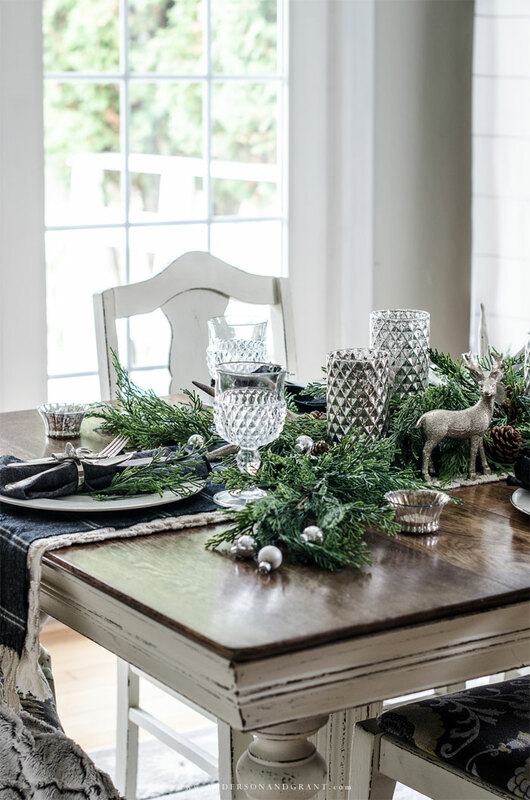 For me, decorating (or in this case, creating a tablescape) is always the most fun and rewarding when it feels like everything is coming together. That's not to say that it doesn't take awhile moving things a little to the left, a little to the right, replacing one piece of decor with another, adding and subtracting......but as you do that, it feels like you are getting closer and closer to what you want. During the planning stages in my mind, this table looked nothing like it does now. Yet once complete, I couldn't be happier with how it looks that it feels exactly the way I wanted it to. 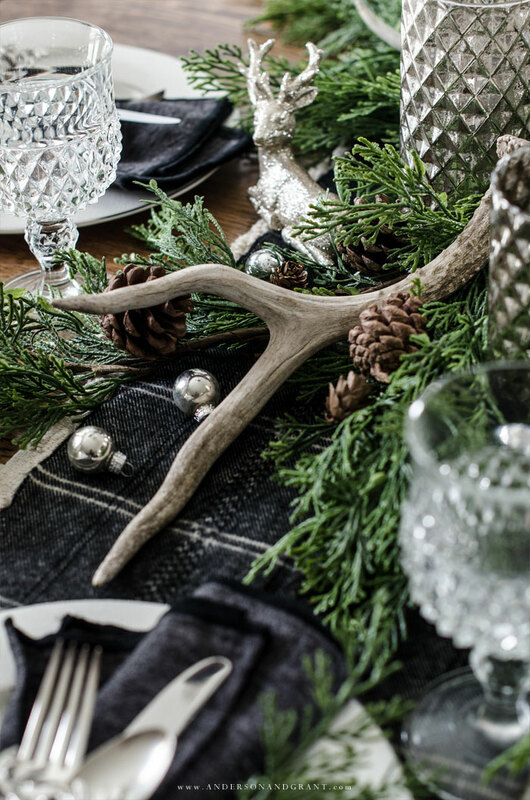 In the end, it really is a mix of both formal and rustic that I think anyone can enjoy. 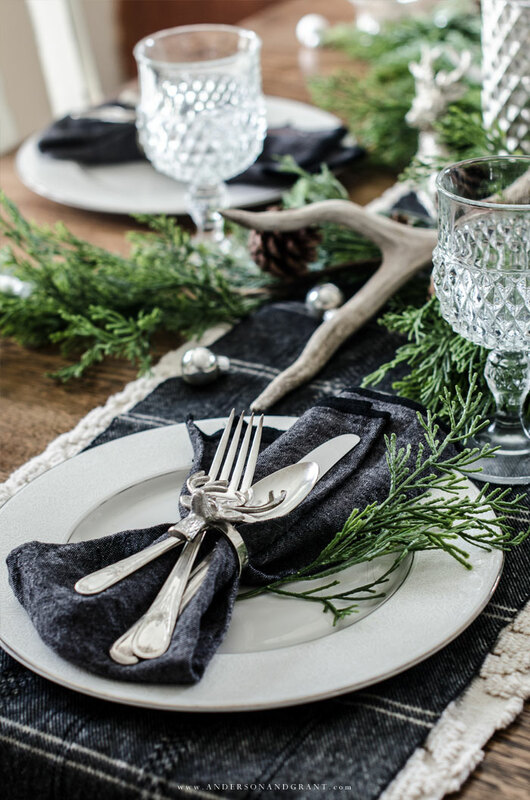 A couple of months ago, I grabbed a set of silver deer napkin rings from Hobby Lobby, and they were the kick off to this table. Although I had no intention of proceeding with a "deer" theme, what I gathered together ended up leading in that direction. 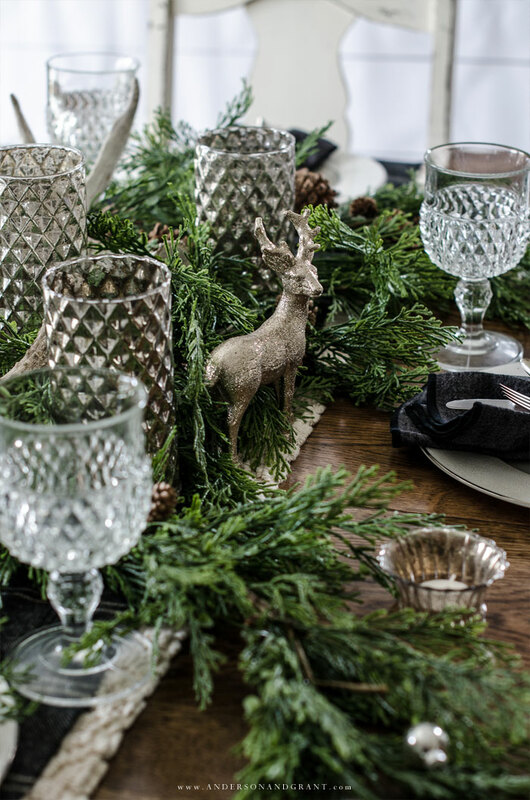 Layered on top of the runner is my centerpiece constructed of some greenery, mercury glass candle holders and tea light cups, silver glitter deer, and antlers. 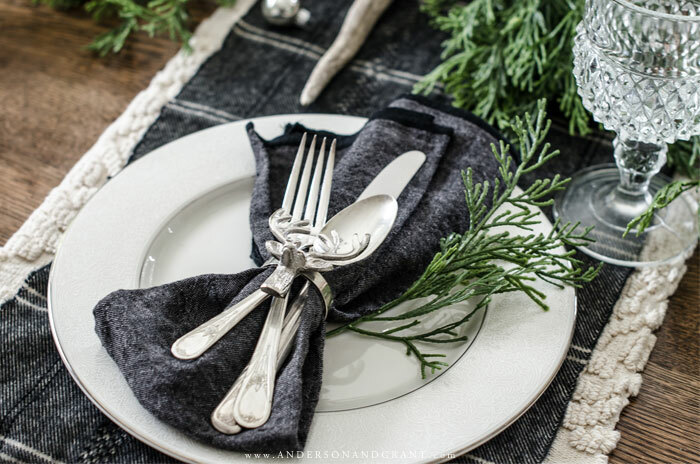 I also casually spread some tiny silver ornaments around the table. 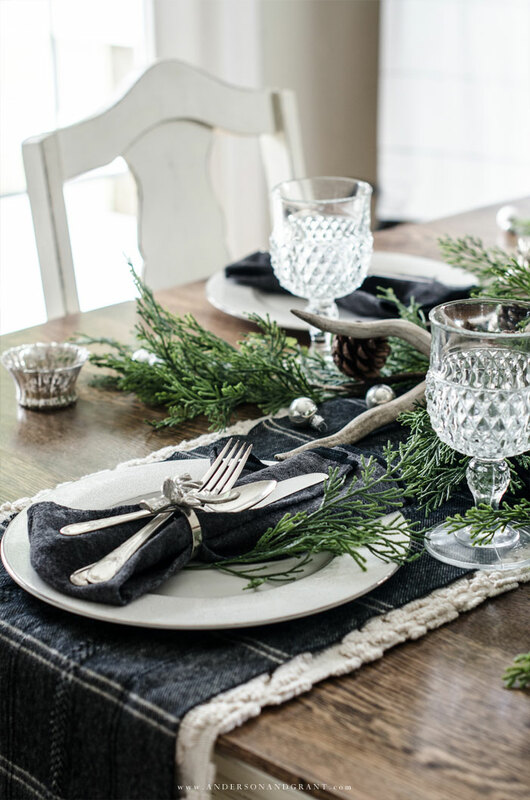 Although I consider this a rustic woodland tablescape, the elegant white dinner plates with a silver rim paired with crystal glasses add a more formal touch. 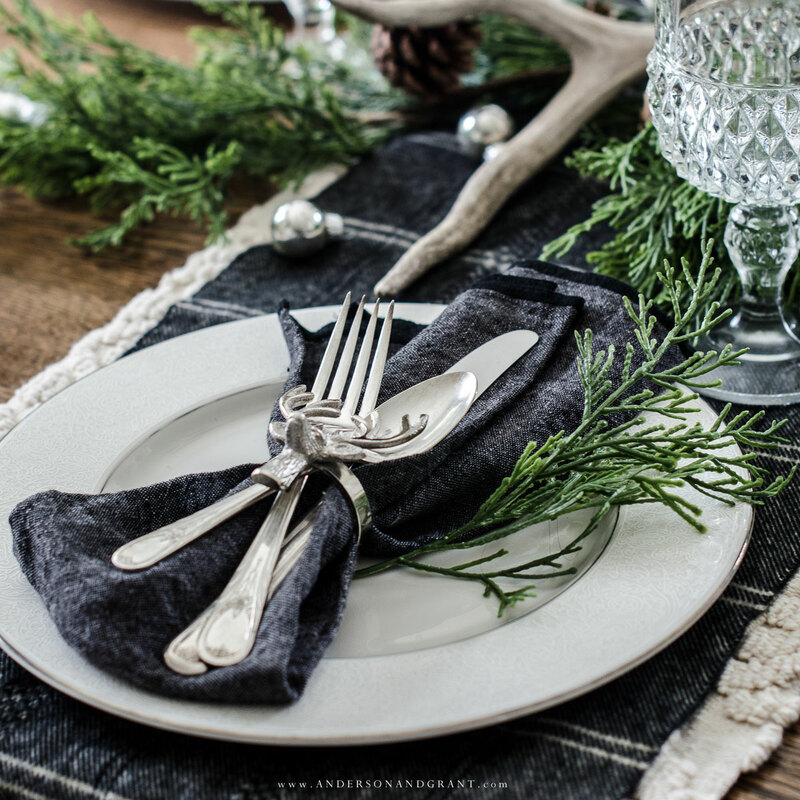 The silver on the plates reinforces the silver elements throughout the table. While I would normally use chargers underneath the plates, I chose to keep it all simple and uncluttered here. The plates are so pretty that I like to let them shine on their own. 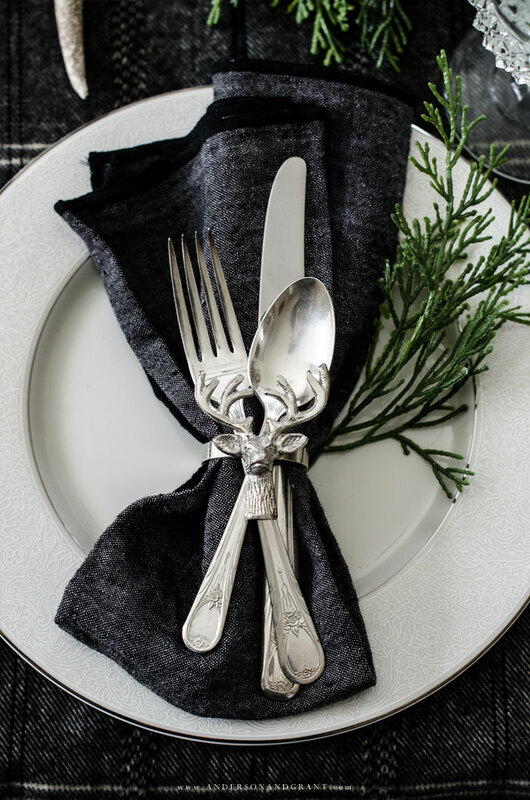 Finally, topping each dinner plate is a dark linen napkin tucked inside the deer napkin rings that were my initial inspiration. 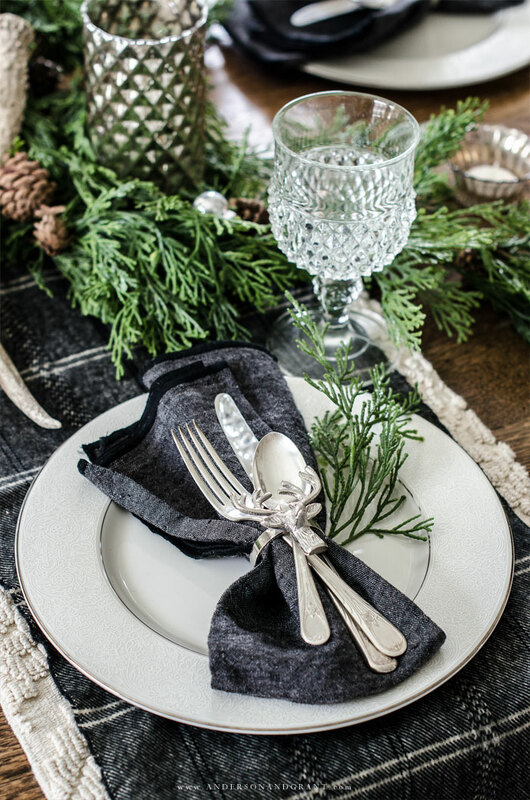 Rather than placing the vintage silverware alongside the plate, I opted to rest them on top of the napkin in the napkin ring. 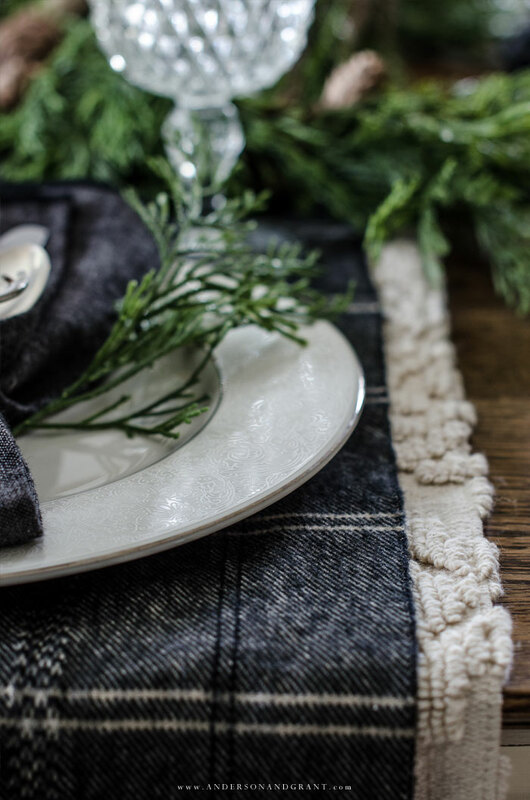 Christmas is a holiday where I think it is nice to break out the "good" dishes and put more effort into making a special place for your loved ones to gather. 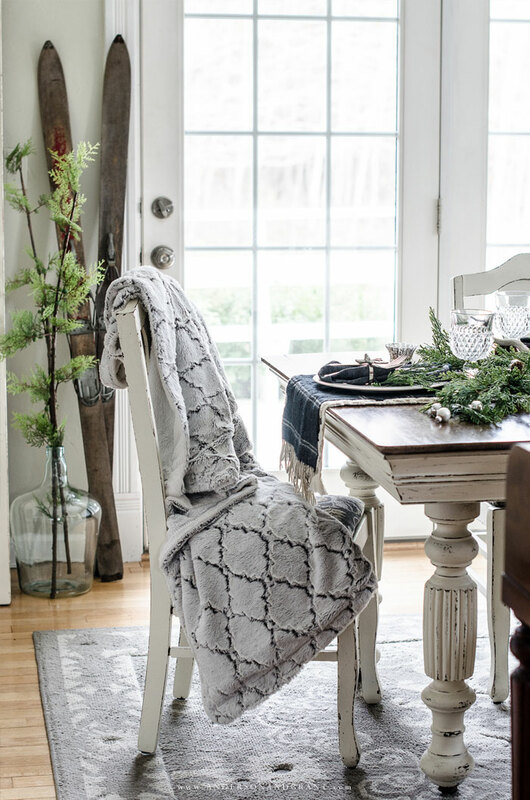 But at the same time, I love how this table incorporates an equally laid back approach by using something as ordinary as a winter scarf down the table. 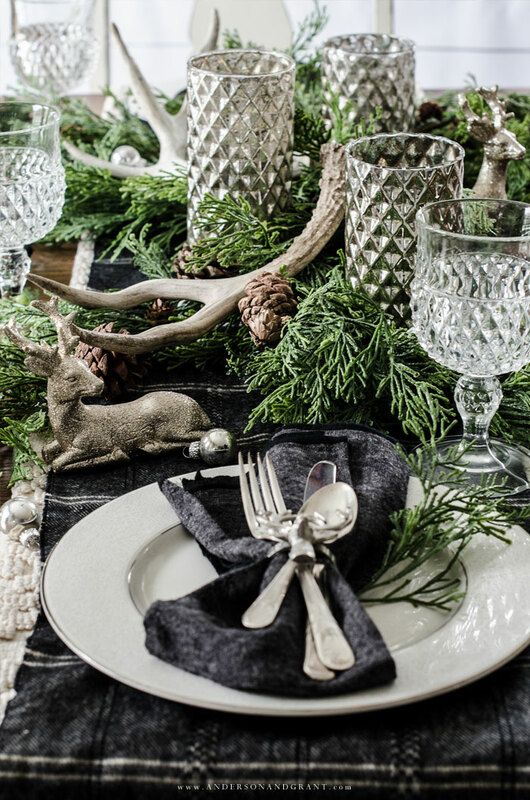 And while you observe sparkle of the crystal glasses and mercury glass candle holders, it it brought back down with natural items like Christmas greens and deer antlers. 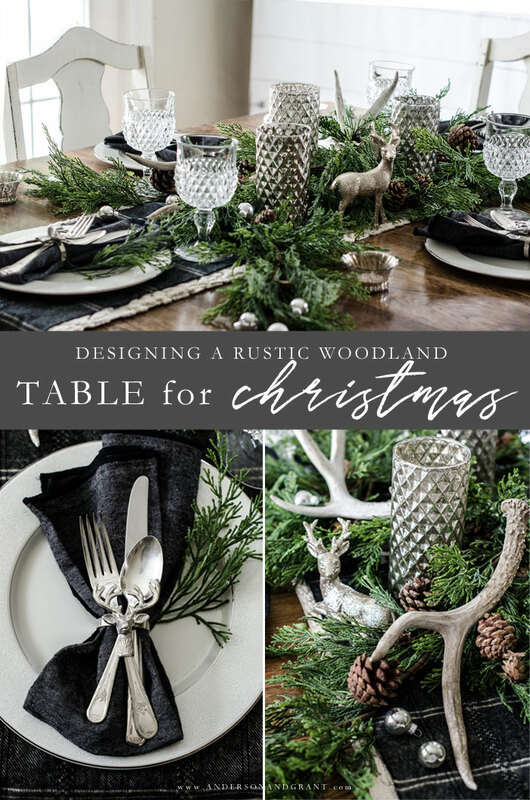 This is really a table of contrast that I think came together beautifully and I'm so thankful that you took the opportunity to have a look at what I created. 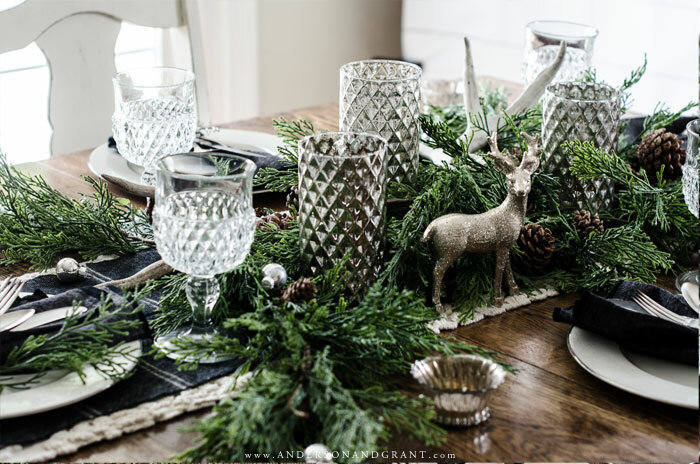 If you feel inspired, feel free to have a look at a few more of my favorite Christmas posts below. 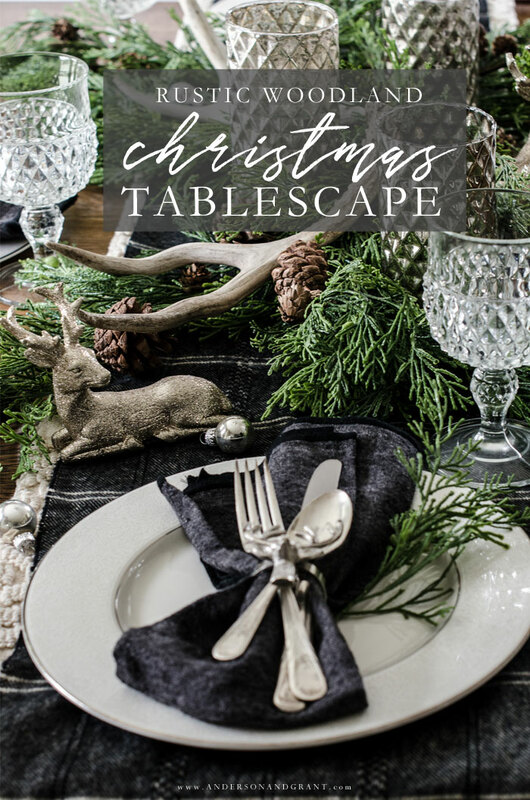 Be sure to visit some of my friends below to see the lovely Christmas tablescapes they've designed in their own homes.